The circuit of an inexpensive and highly secure electronic security system is explained below. This electronic security system can be used in banks and other high security areas. A normal electronic security system will have a transmitter and a receiver. The transmitter sends out an IR laser and this will be received by the receiver. When an intruder walks past the device, the IR beam is cut and thus the alarm is activated. But, this system has some major disadvantages like limited range and poor line of sight. These disadvantages are eliminated through the PIR sensor circuit explained below. Instead of infrared or laser transmitters and receivers, PIR (Passive Infrared Radial) sensors are used in this circuit. The sensor is basically a pyroelectric device. When the device is exposed to infrared radiation, it generates an electric charge. The device is made of crystalline material. According to the change in the amount of infrared striking the element, there will be a change in the voltages generated, which is measured by an on-board amplifier. The infrared light explained here refers to the light radiating from all objects in its field of view. The reason for not having a transmitter and receiver is that the device does not emit one, but only accepts the energy emitted from objects above absolute zero in the form of radiations. Thus the temperature will be different for a human working past a sensor, and that of a wall right in front of it. Thus the word â€œpassiveâ€ is used in PIR to explain that it does not emit a radiation and receive it, but instead accepts the incoming infrared radiation passively. 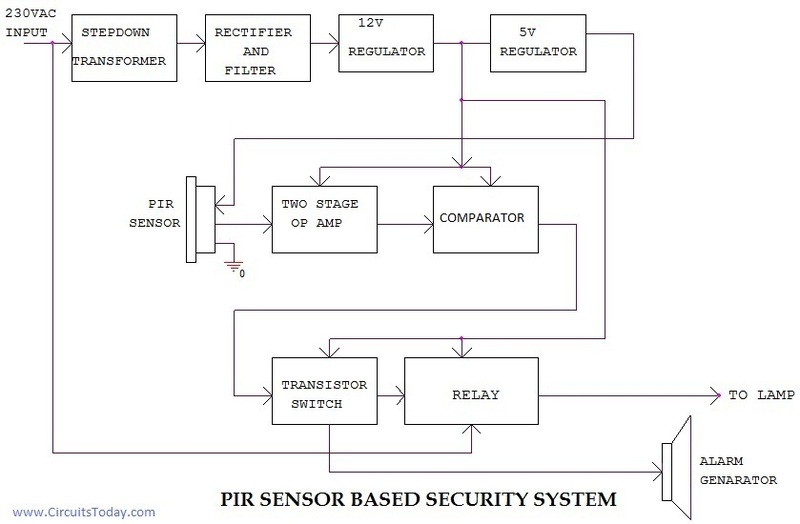 The block diagram of the PIR based security system is given below. The device contains a special filter called a Fresnel lens, which focuses the infrared signals onto the element. As the ambient infrared signals change rapidly, the on-board amplifier trips the output to indicate motion. We can say that the PIR sensor is a human body sensor because it is only activated when a human or animal walks past the sensor. The PIR sensor is the heart of the project. We can design the project in such a manner that as soon as the burglar or intruder walks past the sensor, the alarms would turn on and the whole lighting system could turn on. D204B PIR sensor is used in this project. The PIR sensor is the heart of the project. This circuit is upgraded and simplified by using modern Arduino boards and 8051 microcontroller. The detailed working of connecting a DSN-FIR800 PIR sensor to an Arduino UNO board is explained. The very same article contains an advanced circuit where an SMS based system can be setup to message the user in case of an intruder alert. 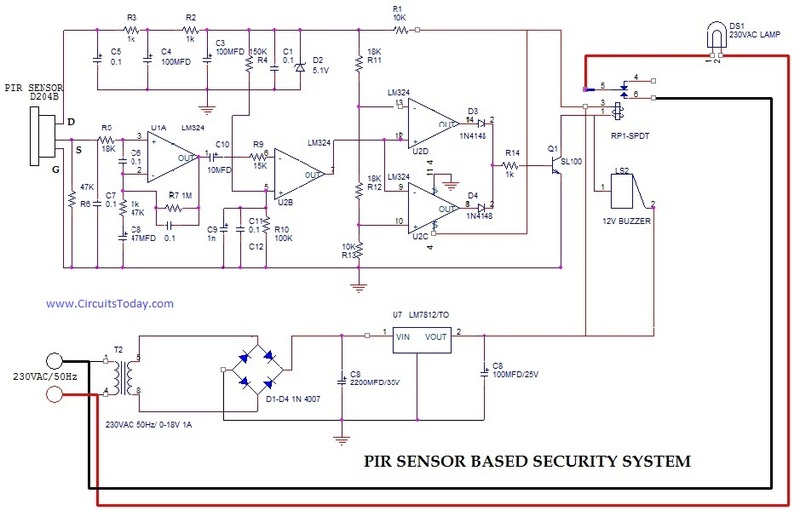 An intruder alarm circuit where the PIR sensor is interfaced with an 8051 microcontroller is provided as well. Two stage OP-amp: LM 324 is used as two stage amplifier. The signal from the PIR sensor is very low so this signal is amplified by using LM324.LM324 is a quad OP-amp. First two op-amps act as amplifiers. The comparator compares the signal from the amplifier and a reference voltage.3rd and 4th OP-amp of LM 324 act as comparator. Whenever the output of comparator make HIGH Q1 transistor gets ON and relay will be energized causing the alarm and lamp to turn ON. Power supply converts 230 Volt AC into 12 Volt DC and 5 Volt DC. IC 7812 is used as the 12 Volt voltage regulator and a 5v zener diode act as the 5 Volt voltage regulator. Some of the caacitos’ units are not mentioned.What about them and also what does MFD mean?Is it microfarad or anything else? Please give the response quickly. Some of the capacitors’ units are not mentioned and what about MFD?Does it mean microfarad or anything else? Some of the capacitors’ units are not given.What about them?Also does MFD mean microfarad itself? Can I get schematics of this circuits? Please. What size of PCB I required? Is this circuit tested? What is the cost of this circuit? Please Reply. can u give me total project report plzâ€¦.? I have several commercial unit that have all failed in different ways. The units use a very similar circuit but have a timer included. These unit are powered by a solar cell and battery pack. These run a LED light array. I would like to keep the concept of the solar panel, LEDs, and battery but would like to manufacture my own PIR controller. Do you have a circuit modification that includes a timer and a PCB design? If so is it possible to have a copy. In advance thanks for any comments or designs. Hw do I work an override into this circuit? Can you please show me a circuit with an override switch? can u give me total project report plz….? can you mail me the pcb layout of this ckt. An important detail is missing: negative feedback in the second amplifier. Tie a resistor(430KÎ©…1MÎ©) from pin 8 to pin 7. A capacitor(0.1ÂµF) in parallel would be useful too. I did a little mistake in the text above: the resistor should be tied from pin 7(output) to pin 6(inverting input) not from pin 7 to pin 8 !!!. So beware! Thanks, was having problems until I saw your comment, thanks for sharing. I have the circuit workwing perfectly using a 1megaohm negative feedback and 100nF in series. I have found just about any pyroelectric can works. SINGLE. One unit(case) of LM324 contains 4 (four) operational amplifiers. Please give me the links for PIR204B datasheet . please do you have an equivalent that i could used in the project? is it possible to replace the 230VAC to 12VDC source with an ordinary 12VDC source which is not to be converted? here there is no availability of pir sensor d204b in india karnataka,banglore… how can i use that in my project???? is PIR SENSOR available in south indian market? Please give me the links for PIR204B datasheet .